It’s the third Wednesday of the month almost 4 p.m. After a busy day at work teachers are heading out the door, to pursue their own learning. They converge at Spruce Glen Public School in Huntsville to share the fine art of teaching writing. No administrator has insisted or suggested we be here. Our study group has been gathering regularly since the fall of 2007 to share a common interest in improving our own writing skills and our skills in teaching writing, an area where our students need improvement. Luckily, in mid-2007 we were the recipients of a Teacher Learning and Leadership Program (TLLP) grant from the Ministry of Education. It has allowed our group to spend time studying under some of the best teachers of writing in North America, to bring that learning into our classrooms and to other teachers, and ultimately to engage our students in rich writing experiences to improve their skills. The two of us, both experienced teachers, initiated this group. We went to New York City in the summer of 2007 for a one-week course on the teaching of writing at Teachers College, Columbia University. Recognizing the value of collaboration, we came back eager to share all that we had learned. Today, Libs Peca is leading the meeting and we are studying Poetry: Powerful Thoughts in TinyPackages from Units of Study for Primary Writing . Libs has asked four of us read a short section of the book before the meeting, and share some of the learning tasks. Following the shared and guided practice, each of us must write independently to experience what our students experience we ask them to write. Some of us find it daunting; others less so. This writing will provide some of the mentor texts for our students the next time we teach poetry writing. We take time to discuss our work and share our learning and the implications for our children. Some of us discover that writing poetry isn’t so hard after all. A student teacher who has joined our group for the evening is amazed that writing poetry isn’t mainly about writing different types of poetry. The writing study group is made up of about 15 regular members, from student teachers to those nearing retirement, teaching JK to grade 8. There are also two literacy coaches, a literacy consultant, and a special education resource teacher. In the summer of 2008, using the TLLP grant to cover registration costs, seven members of the group — ourselves, Libs Peca, Wendy Stephen, Debbie Holtby, Chris Lynd, and Jennifer Clark — travelled to New York to study writing under the guidance of Lucy Calkins, founder of the Teachers College Reading and Writing Project Summer Writing Institute at Columbia University, and author of countless books about teaching writing ( readingandwritingproject.com). One thousand teachers from nine different countries attended this 26th writing institute. We all attended Lucy’s morning keynote address, but the rest of the day we worked with Calkins’s staff developers in smaller specialist groups geared to the grade we taught or to the role we had within our board or school. At the end of each day, the seven of us, our heads full of new ideas, would gather in our residence room to debrief and share the writing we had done. “It was some of the most enriching I have ever had,” said Wendy Stephen, after attending her first writing institute in 2008. It is 4:45 and we try to be strict about ending our meetings at 5 o’clock so the parents in our group can get home. Libs asked Debbie to share what she did with a poetry unit in her grade 8 class. Debbie gathered ideas from her notes from the institute and other books. She has a wealth of student examples and the modelled writing from the mini lessons she taught, which we look at on the document camera. We discuss how we can adapt the lessons for the Junior grades, or even for Primary learners. We are all madly scrawling notes. Not all of our writing groups are focused on studying a book; our topics are as varied as we are. We attempt to meet the group’s needs, respecting the fact that not everyone went to New York City. For example, one focus of the Columbia University writer’s workshop is conferencing with children about their writing — one on one or in small guided groups — and how to recognize quickly what students can do to improve their writing. We brought this new skill back to our study group by having each teacher bring a sample of student work, especially from students who were puzzling to them or who weren’t progressing as they thought they should. We have also spent meetings watching videos and sharing books and techniques used by Calkins and her staff developers, who are engaged in perfecting the art of the student conference to improve writing. At other meetings, we have each brought a mentor text and explained how the text could be used in a mini lesson to teach a specific writing skill, and how to connect reading and writing within the literacy block. In addition to the travel to New York City, the TLLP grant has given our group two other great benefits: we have purchased writing resources, such as mentor texts and books by Calkins and her staff developers; and we have been able to meet as grade teams to plan a year of writing that fits with our board and school goals and our new learning. The TLLP grant comes with a few stipulations, including the collection of data. We did a pre and post teacher survey in October 2008 and May 2009, and found that there was a 30 percent increase in teachers who said they explicitly teach writing. As well, 49 percent more teachers use mentor texts to teach writing and 26 percent more use student conferencing. Based on that data, two areas of focus for this year are guided writing and working talk time into the writers’ workshop before independent work begins. 40 percent more grade 4 to 8 students believe they are effective writers; 20 percent more say they enjoy writing at school. The spinoffs from our group and the benefits of the TLLP grant have been many. We started small with representation from two schools. As word has spread, our group has grown to include teachers from five different area schools. In our schools, there is discussion about teaching writing and an air of excitement about writing among students. 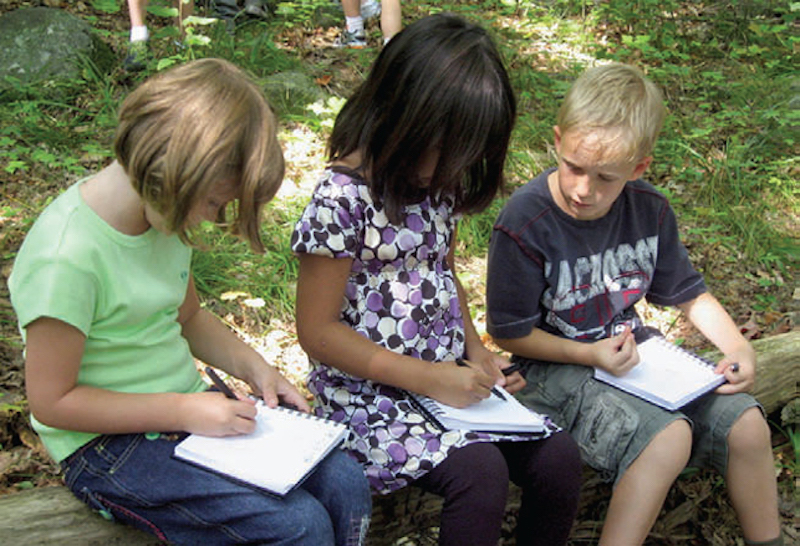 We have a common “writing language” and use common tools, like special writers’ notebooks for our children. We have a common architecture for teaching writing using a workshop approach. Daily writing is important if students are to improve, and we expect them to use their learning each and every day. We know that sharing student writing and critiquing each other is an important part of growth as a writer. We know that teachers must write and model writing for their students. We use a First Class Conference to communicate and we have started a wiki to share our learning with a broader audience ( thewritersworkshop.wetpaint.com). Best of all, the TLLP has afforded us the opportunity to take charge of our own professional learning and we feel we have wisely invested the funds provided.